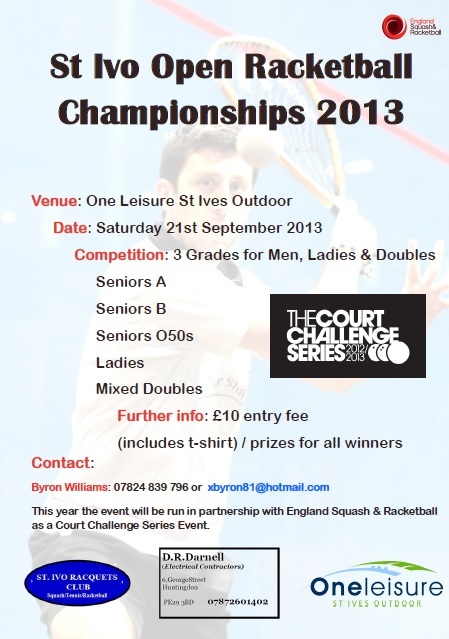 The St Ivo Open Racketball Championship is back for 2013! It is run in partnership with England Squash and Racketball and is a Court Challenge Series Event. Entry is £10 per person per grade and includes a free t-shirt. There will be prizes for all winners. For the entry form, click here. For more information on the event, contact Byron Williams on 07824 839 796 or email xbyron81@hotmail.com. And don’t forget to head back to UK-Racketball after the event for results, photos and event report!